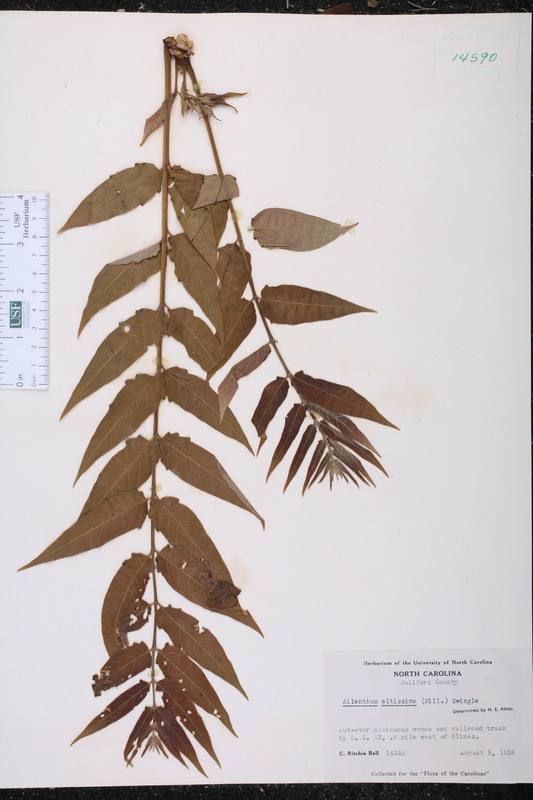 Citation AILANTHUS ALTISSIMA (Miller) Swingle, J. Wash. Acad. Sci. 6: 495. 1916. 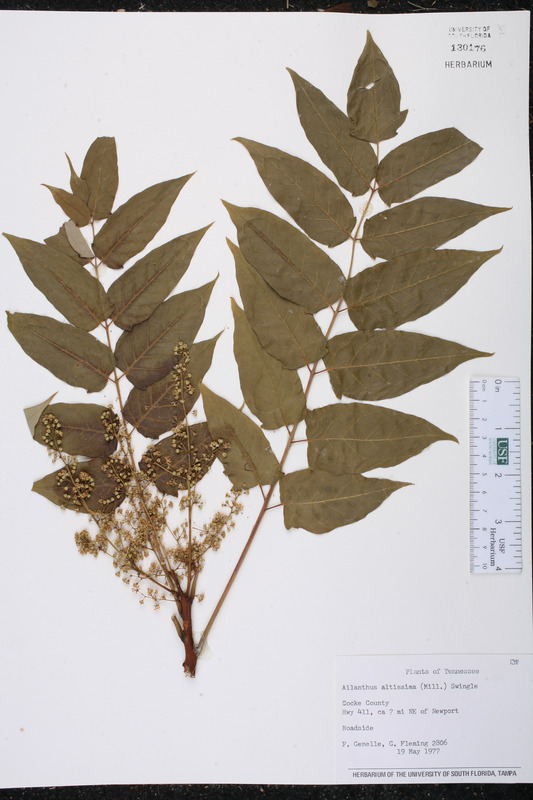 Basionym: Toxicodendron altissimum Miller 1768. Ailanthus glandulosa Ailanthus glandulosa Desfontaines, Mém. Acad. Sci. (Paris) 1786: 265, pl. 8. 1788. Ailanthus pongelion Ailanthus pongelion J. F. Gmelin, Syst. Nat. 2: 726. 1791, nom. illegit. 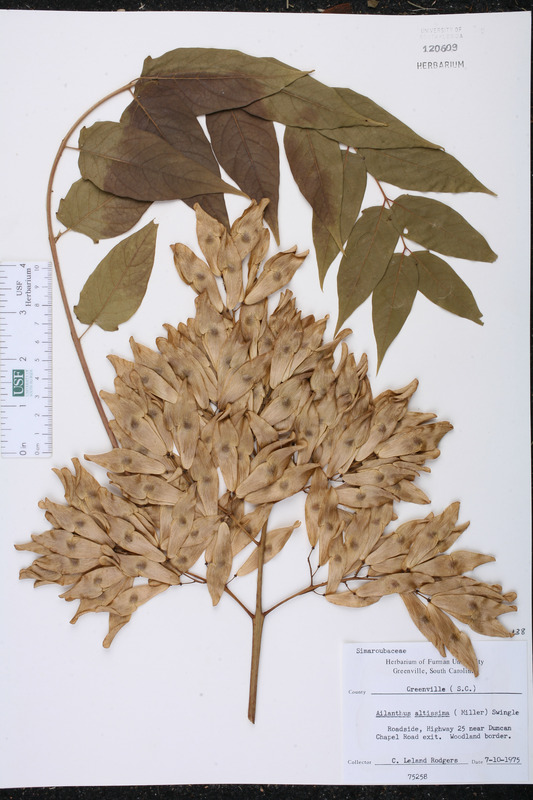 BASIONYM: Ailanthus glandulosa Desfontaines 1788. Pongelion glandulosum Pongelion glandulosum (Desfontaines) Pierre, Fl. Forest. Cochinch. 3: sub pl. 294. 1893. 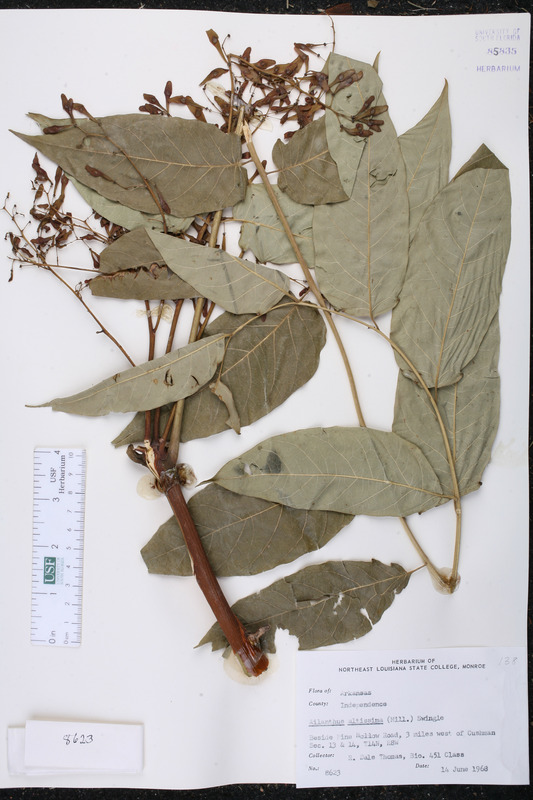 BASIONYM: Ailanthus glandulosa Desfontaines 1788. Ailanthus altissima forma erythrocarpa Ailanthus altissima (Miller) Swingle, forma erythrocarpa (Carrière) Rehder, Bibl. Cult. Trees 386. 1949. BASIONYM: Ailanthus erythrocarpa Carrière 1867. Ailanthus altissima forma pendulifolia Ailanthus altissima (Miller) Swingle, forma pendulifolia (Dippel) Rehder, Bibl. Cult. Trees 386. 1949. BASIONYM: Ailanthus glandulosa Desfontaines, var. pendulifolia Dippel 1892. Ailanthus altissima var. erythrocarpa Ailanthus altissima (Miller) Swingle, var. erythrocarpa (Carrière) Rehder, Man. Cult. Trees 527. 1927. BASIONYM: Ailanthus erythrocarpa Carrière 1867. Ailanthus altissima var. pendulifolia Ailanthus altissima (Miller) Swingle, var. pendulifolia (Dippel) Rehder, Man. Cult. Trees 527. 1927. BASIONYM: Ailanthus glandulosa Desfontaines, var. pendulifolia Dippel 1892. Ailanthus altissima var. sutchuensis Ailanthus altissima (Miller) Swingle, var. sutchuensis (Dode) Rehder & E. H. Wilson, in Sargent, Pl. Wilson. 3: 449. 1917. BASIONYM: Ailanthus sutchuensis Dode 1907. Ailanthus cacodendron Ailanthus cacodendron (Ehrhart) Schinz & Thellung, Mém. Soc. Sci. Nat. Cherbourg 38: 679. 1912. 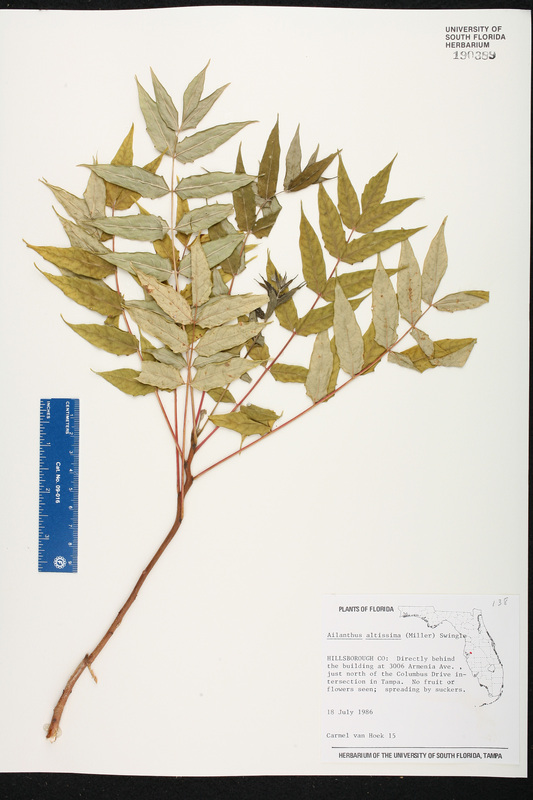 BASIONYM: Rhus cacodendron Ehrhart 1783. Ailanthus cacodendron var. sutchuensis Ailanthus cacodendron (Ehrhart) Schinz & Thellung, var. sutchuensis (Dode) Rehder & E. H. Wilson, in Sargent, Pl. Wilson. 2: 153. 1914. BASIONYM: Ailanthus sutchuensis Dode 1907. Ailanthus erythrocarpa Ailanthus erythrocarpa Carrière, Rev. Hort. 38: 419. 1867. Ailanthus giraldii var. 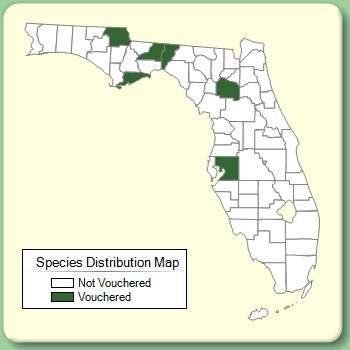 duclouxii Ailanthus giraldii Dode, var. duclouxii Dode ex Rehder, Man. Cult. Trees 527. 1927. Ailanthus glandulosa forma erythrocarpa Ailanthus glandulosa Desfontaines, forma erythrocarpa (Carrière) C. K. Schneider, Ill. Handb. Laubholzk. 2: 130. 1907. BASIONYM: Ailanthus erythrocarpa Carrière 1867. Ailanthus glandulosa var. erythrocarpa Ailanthus glandulosa Desfontaines, var. erythrocarpa (Carrière) Mouillefert, Traite Arbr. Arbriss. 1: 222. 1891. BASIONYM: Ailanthus erythrocarpa Carrière 1867. Ailanthus glandulosa var. pendulifolia Ailanthus glandulosa Desfontaines, var. pendulifolia Dippel, Handb. Laubholzk. 2: 365. 1892. Ailanthus glandulosa var. rubra Ailanthus glandulosa Desfontaines, var. rubra Dippel, Handb. Laubholzk. 2: 365. 1892. Ailanthus glandulosa var. spinosa Ailanthus glandulosa Desfontaines, var. spinosa A. Vilmorin & Bois, Frutic. Vilmor. 31. 1904. Ailanthus glandulosa var. sutchuensis Ailanthus glandulosa Desfontaines, var. sutchuensis (Dode) Rehder, Mitt. Deutsch. Dendrol. Ges., ed. 2. 1912: 187. 1913. BASIONYM: Ailanthus sutchuensis Dode 1907. Ailanthus macrophylla Ailanthus macrophylla G. Nicholson, Hand-List Trees Shrubs 1: 53. 1894. Ailanthus mascula Ailanthus mascula G. Nicholson, Hand-List Trees Shrubs 1: 94. 1894. Ailanthus peregrina Ailanthus peregrina (Buchoz) Barkley, Ann. Missouri Bot. Gard. 24: 264. 1937. BASIONYM: Albonia peregrina Buchoz 1783. Ailanthus procera Ailanthus procera Salisbury, Prodr. Stirp. Chap. Allerton 171. 1796, nom. illegit. BASIONYM: Ailanthus cacodendron Ehrhart 1783. Ailanthus rhodoptera Ailanthus rhodoptera F. Mueller, Fragm. 3: 43. 1862. Ailanthus rubra Ailanthus rubra H. Jäger, in H. Jäger & Beissner, Ziergeh. Gärtn. Parkanl., ed. 2. 18. 1884. Ailanthus vilmoriniana Ailanthus vilmoriniana Dode, Rev. Hort. 1904: 444, f. 184. 1904. BASIONYM: Ailanthus glandulosa Desfontaines, var. spinosa A. Vilmorin & Bois 1904. Albonia peregrina Albonia peregrina Buchoz, Herb. Color. 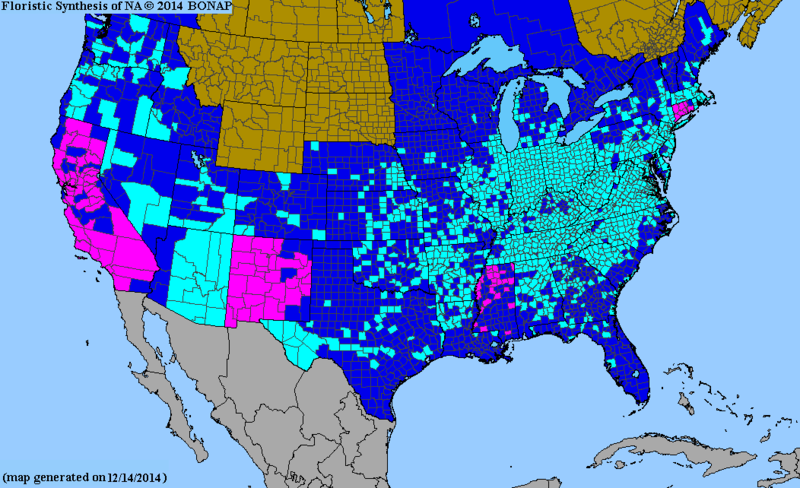 Amerique pl. 57. 1783. Pongelion cacodendron Pongelion cacodendron (Ehrhart) Farwell, Amer. Midl. Naturalist 12: 67. 1930. 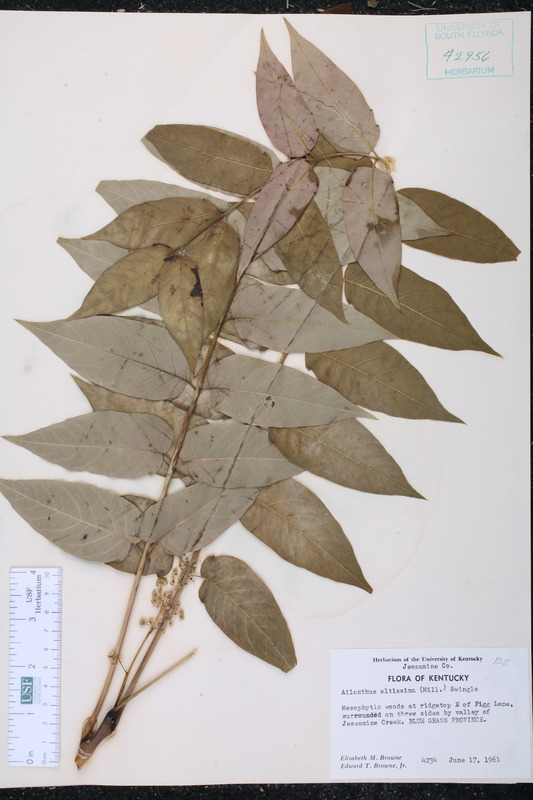 BASIONYM: Rhus cacodendron Ehrhart 1783. Pongelion vilmorinianum Pongelion vilmorinianum (Dode) Van Tiegham, Ann. Sci. Nat., Bot., ser. 9. 4: 276. 1906. BASIONYM: Ailanthus vilmorinianum Dode 1904; Ailanthus glandulosa Desfontaines, var. spinosa A. Vilmorin & Bois 1904. Rhus cacodendron Rhus cacodendron Ehrhart, Hannover. Mag. 21: 225. 1783. Rhus sinensis Rhus sinensis J. Ellis ex Houttuyn, Nat. Hist. 2: 212. 1774.